Watanda Lodge at Lake Vera WEEKEND SPECIAL-ITS BEAUTIFUL OUT! Lodge, 1 Bedroom + Bunk Area, 4 Baths, (Sleeps 8 in beds). WINTER SPECIAL: JAN WEEKENDS $250/night, includes housekeeping for up to 6. Please message me before you make a reservation so I can send you the Special. Otherwise you will pay the VRBO/Home Away posted rates. WINTER USE: 8 GUESTS ONLY. The camping cabins are not winterized. PETS: Pet Friendly. Please read the entire pet policy below. FINE PRINT: This is a nonsmoking lodge, smoking is permitted at the fire ring on the waterfront. The use of "medical cannabis" is not permitted. We are not a fit for you if you plan on using this product on our property. If discovered you will be charged an additional $250 cleaning fee, the remainder of your reservation will be canceled and you will be asked to leave. SEE ALSO CABIN LISTING AT VRBO #33191. CABIN RENTS SEPARATELY FROM THE LODGE. Looking for a romantic weekend for 2 or large family vacation? Watanda Lodge, located 2 miles from downtown Nevada City is the perfect get-away for families or friends who vacation together. 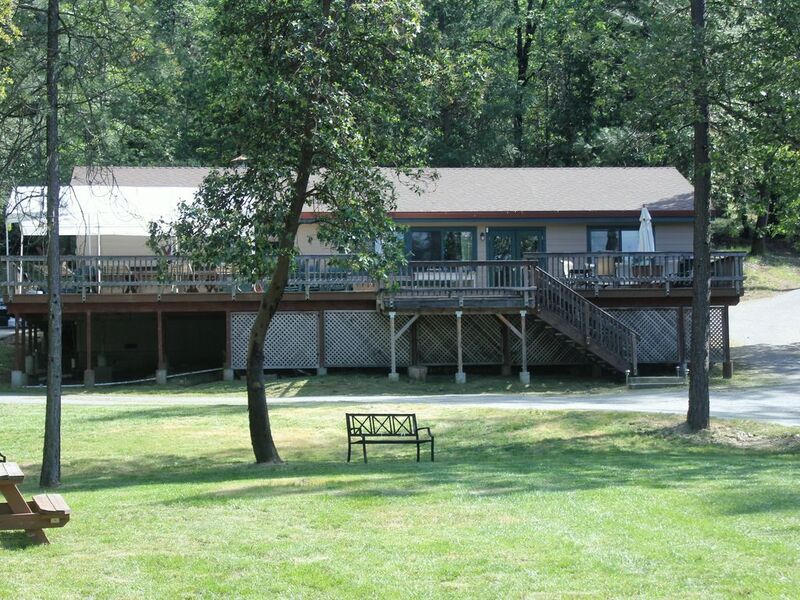 Our 40 acre site is a retired resident camp renovated for family enjoyment. Watanda Lodge alone can be rented by your family or a couple for a romantic weekend or both lodge and cabin (VRBO #33191). Watanda Lodge sits on Lake Vera whose ownership is shared by 3 seasonal working camps. The non-smoking lodge contains a large stocked, gourmet kitchen for meal preparation for up to 30 persons. The lodge bathroom one toilet and one tub/shower. Adjacent bath house has 3 toilets and 3 showers. The Great Room has a large ten foot fireplace with wood burning insert for chasing away the winter chill. Heat and A/C throughout lodge. Direct-TV/VCR/DVD & wireless DSL, phone for local calls. Large video/DVD collection, books & puzzles for your enjoyment. Maximum in the lodge is 8 for overnight sleeping, additional guests use the camping Kiosks. Day guest use is 30 maximum. Lodge sleeping accommodations for 8, rest of gusts use the Camping Kiosks. The large dorm style Lodge bedroom contains one king bed, (linens provided for king bed only), two twin bunk beds and one twin bunk bed in the great room, only bottom sheets are provided for bunks Additionally, there are 12 pillows and 4 sleeping bags, Portable crib/playpen & high chair available upon request. Toiletries and towels are provided for groups of 4 only, larger groups will need to bring own towels. Cabin rents separately from the lodge. LAKE VERA is a small private lake, there are a variety of water craft for your use including 6 canoes and 3 kayaks. Life jackets are provided and required for all boaters. No fishing license is needed. A picnic area, large fire ring and stage are located on the waterfront, accommodating 40. The lake is drained from about November 1 (depending on rainy season) to mid April; water level begins to drop in August and can be quite low in dry summers. There is an ALL-Lake quiet from 9:30 pm-7:00 am in which only quiet activities that do not create a disturbance. Minimum stay is 3 days. Kiosks and waterfront use included in rental. Small cabin on the property may be also rented at the same time if the entire site is not rented by your group. Motor Homes and school buses can navigate our entrance, but not large Coaches. We do not have RV hook-ups or the capacity to run extension cords. NEVADA CITY: Nevada City has many year-round events and the Fall colors and weather are not to be missed. December has Victorian Christmas and Grass Valley has Celtic Christmas, both are weekly events thru December. The fairgrounds are close by with many antique and quilt shows. There are also several wineries in the area and many fine restaurants and antique stores. Grocery stores, consumer services and hospital, are less than 5 miles away. SUMMER USE: Great for families large or small, or friends who vacation together. The Yuba River is 3 miles away. Equestrian trails and staging areas along Hwy 20. Many developed bike trails in the area, we permit non-motorized biking only, safety gear applies. WINTER USE: Nevada City and Grass Valley both have weekly Christmas Fairs in December offering many local artisans. Great location for Tahoe skiers who do not want to pay resort prices. Cross country skiing 45 minutes away on Hwy 20, snow play less than 20 minutes up Hwy 20. We are at 2500 ft elevation and is located off main road which is plowed but has long driveway that is not plowed. There is parking at the road entrance if snow is a problem, but rarely is. Saucer sleds available. We can only accomodate 8 total in the winter. PETS: Well behaved owners with good citizen dogs are welcome, however dogs are not allowed in the kitchen or on furniture. Please help us to remain pet friendly by observing this. Dogs must have current rabies vaccination. It is recommended that dogs be treated 3 days before your arrival with a topical flea and tick medication such as 'Advantix'. Dogs are not allowed to roam the property and must be under the direct control of the owner. Any dog showing aggressive behavior or interferes with guest enjoyment will be asked to board the dog(s) off site. Check out our website for additional pictures and information. On line calendar is kept up to date daily. ** Directions and 'What to bring list' are on our website. John and I love the sierras and could not be happier as caretakers of this wonderful piece of property. As our grandbabies come along they have enjoyed the great outdoor experience at grandma and grandpa's lake. After working at the summer camp next door for 20 years, I knew this is where I wanted to retire to, so when the opportunity to purchase Camp Watanda became available, we bought it! We restored the site with modern amenities making it suitable for family use. The abundant wildlife and quiet elements of nature after all the kids have gone home after the summer. We have 40 acres for you to prowl around in. Towels provided for 4 or less. Large groups must bring their own. This service is intermittent. There is no guarantee that service will be available during your stay. 1 range with 5 burner cook top and second built in oven/convection oven. The lodge was cozy and plenty of rooms for 9 of us( 2 children and 7 adults).Everyone had a good time paddling in the lake and cooking in the kitchen.A gem in the woods indeed.We would come back again in the near future. Great place for family and kids! Our family had a great time! Thank you!! We had the BEST time! I’ve missed going on camping trips over the last few years and “settled” to stay in a cabin at the lake. It was a wonderful lodge with great facilities. The lodge was clean and well-appointed to meet our needs. The king bed was SOOO comfortable. The a/c helped keep it comfortable while in the high 90’s. I liked the “limited” cell phone/internet coverage (we have AT&T) that allowed us to relax and not be glued to our phones while at the lake. 😊� We appreciated the pantry supplies, toiletry items, and blow dryer that was available. The grounds are beautiful and our dog enjoyed being able to play fetch freely and swim for the first time! We enjoyed the canoes and kayaks as well. Thank you so much! This time has helped me “scratch” my “itch “ to camp! We had a great time at the lake. The lodge easily slept alll four adults and four children inside. The kids had a great time canoeing and kayaking. The lake was full and we enjoyed seeing the other camps in session on the lake. I would highly recommend the lodge for a relaxing indoor camping experience. We've been coming to Watanda for ten years now! It's the highlight of our summer. Kathyrn has the most amazing place in an incredible setting. It's the perfect mix for those that want to sleep outside and those that prefer inside. The deck is an amazing gathering spot and has ample room for us all to have dinner together at the tables. The most gracious and thoughtful host. I can't recommend this spot more highly. For my daughter's birthday in September, I reserved the cabin at Camp Watanda. I actually made the reservations way back in March and was pleased with the wonderful communication from the owners. There were no surprises when we arrived, and since it was "self check in"..we were able to arrive on our own schedule. Even though my daughter had broken her foot days before the trip and was in a cast, we had a wonderful time. The cabin was so clean and well stocked and especially cozy! The lake was low, but there was plenty of wildlife and my grandson thoroughly enjoyed himself. The whole experience was amazing.. restful and peaceful. I highly recommend this location to anyone who needs to get away, without really being that far off the grid. I can't wait for our next trip to paradise. Canoeing, Antique stores, Gold Mines, Tahoe, one hour away, Nevada County Fairgrounds has many weekend events from quilt shows to horse shows. Lake is drained from November 1 to April 1 and can be quite low in dry/drought summers. Lodge can be rented for less, please indicate this in your quiry so that we can send you a quote.